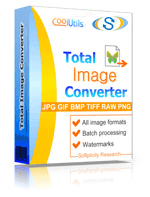 Total Image Converter is a kind of tool that converts PCD images to BMP and features an array of editing options. It features an intuitive interface and therefore it is very easy to navigate for first time users. Many users who have tried their hand at it say this is the only converter they are going to use from now on. 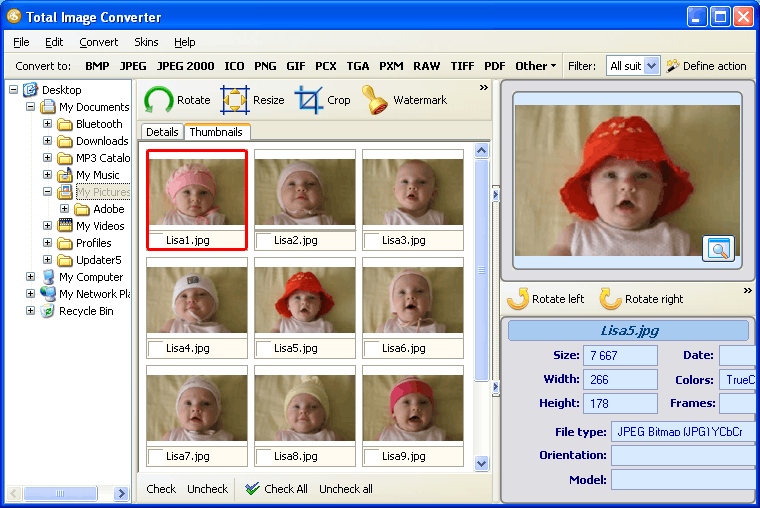 One reason why it is referred to as batch image converter it the batch function featured in the converter. This function allows users to convert PCD to BMP in batch, i. e. many images at once. That's not really difficult. The only difference is the number of checked files. 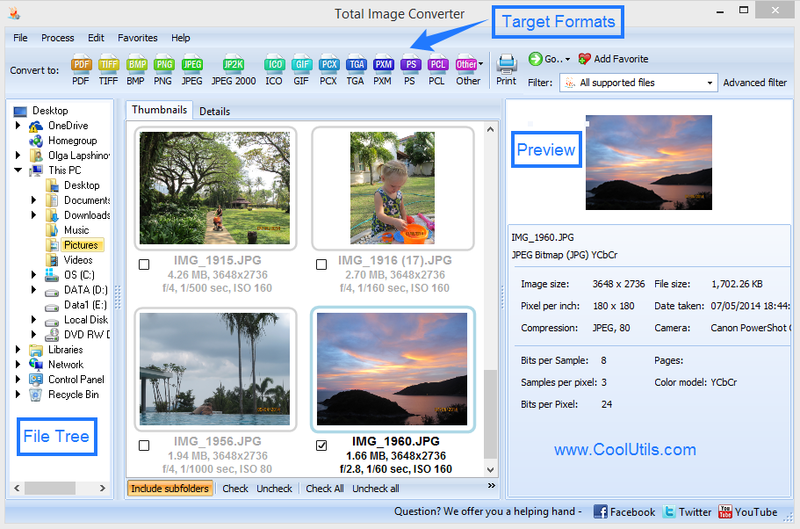 This converter has several advanced editing options - Crop, Resize, Rotate and Watermark. Launch the program and navigate the folder tree. Find the folder with PCD images. Check the PCD files in the list. Press 'Check All' to select all the images. The images in the list can be displayed as thumbnails. If you click on one, its magnified version will appear in the built-in viewer on the right. Here you can also view image details and characteristics. Use Watermark option to add dates, comments, logos and descriptions to your output images. Crop allows you to cut off unwanted image details. Resize option permits you to adjust the size of your BMP images. Rotate option allows you to choose between any of the four possible positions for your output images. When you have defined the look of your target image(s), select BMP in the list of target formats. The wizard will guide you further through the procedure. Here you can choose destination folder and go through the four options once again. Click 'Start!' in the end. This PCD BMP Converter features command line support, so you can convert PCD to BMP from within other applications. The program integrates into the OS, so you can convert images viaa right-button menu. 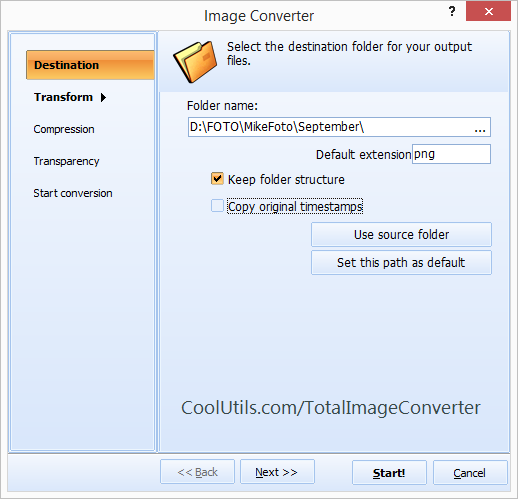 Total Image Converter has two versions. The free trial version is valid for 30 days. The license version is subject to regular updates, which are provided for free and on a regular basis.